Between April 1, 2018 and April 1, 2019 I was at my home base in Lake Placid, New York for about 130 nights. I spent the other 235 nights on the road, in the beds pictured below in chronological order. Two other locations in Washington, D.C.
Every year the same thing happens: it’s summer and then suddenly I’m racing tomorrow. In the annual cycle of biathlon, fall is the season of acceleration. We literally increase our speed in training as the days flip by, each one shorter than the last. Now, on the eve of the World Cup opener, there’s a palpable break in that momentum, a pause for one last deep breath. Here’s a reflection on the final months of preparation. In September my dad and I both rode 50 miles for the Kelly Brush Foundation. I did so in a new biking jersey from our team sponsor, Maloja. He did so with a new hip! We had a 2-week training camp in Lake Placid in September, which meant I got to sleep in my own bed, and wake up each day to this view: Mirror Lake, 7am, living up to its name. Erik and I celebrated the end of my training camp with our favorite fall tradition: afternoon apple-picking excursion followed by Sunday Night Football at Buffalo Wild Wings in the big city of Plattsburgh, NY. In the end of September I had “holiday week” written on my training plan! I went on a solo vacation to Montreal and visited 3 spas in 3 days. 100% would recommend and will do again. The second half of my holiday week was well-spent with my friends Maura and Kenny at a campsite in the Catskills. Fall arrived in Lake Placid on schedule, with peak foliage by September 21. Fall in the northeast = daily training in the rain = daily cleaning the rifle. In October, I escaped the rainy northeast for a month of altitude training in the sunny west. My cousin got married in Truckee, CA just one week before our team training camp was scheduled to begin in Utah. I was able to attend her wedding, spend a week training in a cool place, and then visit some friends in the Bay Area on my days off before flying to the camp. It was one of those rare moments when my training schedule aligned with my personal life in such a way that enabled me to fully commit to both. My travel day started at dawn with a drive to Vermont, followed by a roller-ski time trial, and then a curbside pack job (including a firearm) at the Burlington airport. Tahoe Rim Trail. Add it to your list! Hard to beat the scenery and weather that the Lake Tahoe area has to offer. Thanks to Auburn Ski Club in Truckee, CA for hosting me for a week of training! This is why people move to California: October weather in Berkeley! After a week of training in Truckee, I headed to the Bay Area for a few days off before our team camp. In mid-October, My teammates and I settled in for our last tough camp of the year. In eight years of full-time training, I have never (I repeat, NEVER) emerged psychologically sound from a three-week camp. Usually I get depressed. It’s the combination of severe physical fatigue, social isolation, and lack of life-balance that gets me. I even warned my new coach, Armin, ahead of time that I might need to leave early. But I am so happy to report that I not only survived this camp, but I really thrived. We did a lot of fun things. This was the first camp in memory where the women and men lived all together in one big house (coincidentally the same rental house I stayed at in 2013 with the Craftsbury Green Racing Project!). I really enjoyed living all together. Sean and Susan (above) have a lot of shared interests including woodworking, freshwater ecology, and NFL stats. Paul and I shared a bathroom for 3 weeks. Pumpkin painting, organized by Joanne!!! Judging by the look on my face, I may actually have had more fun at this camp than anyone else…or maybe just more glühwein. Susan and I are studying Russian and enjoyed doing so together in the Utah sun. Sometimes at training camps I need a reason to celebrate. Hence the Ofrenda (alter) for Dia de los Muertos (Day of the Dead.) I lit it up on November 1st so my dead ancestors could cross over into the world of the living. My teammates are used to this kind of shenanigan by now. These bro’s… can you imagine the collective caloric intake? I especially enjoyed getting to know Vasek (front right) who is more than 10 years younger than me and was at his first National Team camp. Sean (thumbs up in the back) was happy too– after many years, he is no longer the youngest! Olympic Champion Michel Greis, as Mickey Mouse, on his first American Halloween. Mike Gibson and I shared the role of some promiscuous lady named Tiara at the Halloween murder mystery dinner. Yes I am wearing a physiotherapy band as a tie. Despite what my photos so far imply, we actually did a lot of training at this camp. Here’s a pic of Suz and me rollin’ up Guardsman’s pass among the aspen trees towards Park City. After three long weeks of camp, we emptied our energy tanks with three roller-ski races. I felt strong skiing in all the races. As for the shooting, I had two great ones and one inexplicably terrible one. Biathlon! After a terrible second race, I reset for the final Mass Start race with a winning attitude. I haven’t won a race in years but I won this one in convincing fashion. It was a great way to finish the camp and start the transition to the racing season. I returned to Lake Placid for one week after the Utah camp. The weather was terrible, as expected. I love my Salomon boots and thank Finnsisu store for the Marwe roller-skis. But there comes a time, after several years of daily use and one final excruciating week of rolling in inclement weather, that it is right and proper to deposit them directly into the trash can. AND BOY DOES IT FEEL GOOD. I flew to Europe about a week before my teammates, foreseeing that my tolerance for November roller-skiing would be exceptionally low (see above). On my birthday, November 19th, my teammates and I reconvened at the Munich headquarters of our new apparel sponsor, Maloja. We are SO LUCKY. Our clothes look awesome and are super high quality. All the other teams are so jealous. In my first on-snow race of the year, I shot 10/10 and reached my first international podium. This was a great way to start the season! This is the training bib that I will wear every day of the season. It is my trail pass, and one of my more precious biathlon souvenirs. This is #5 for me. And suddenly, it’s here: the culmination of millions of heartbeats, countless exhausting workouts, weeks upon weeks of training, and three long seasons of preparation. Winter starts tomorrow. It’s go time. Snow time! Show time. I’m in great shape. The shooting feels easy. I’m healthy and strong. I’m confident and happy. It’s in stark contrast to last year, when my pre-race blog post was about how it’s impossible to know if you are in good form. When you know, you know. I have Armin to thank for this year. I’ve only had a few truly great coaches in my life, and he is one of them. The relationship between coach and athlete is so complicated, and only becomes more nuanced as the athlete advances and the two become increasingly intertwined in work and life. I feel lucky to have experienced this relationship in all its complexity. It’s something most adults will never know. No matter what happens tomorrow, or during the rest of the upcoming season, I will always remember this year fondly. I made the right choice to stick around. Ever since deciding in May to continue doing biathlon for one more year, I’ve been going full steam ahead. From the outside my lifestyle looks very much the same: practice twice a day, skiing and shooting, teetering between training hard and training too hard. But this year, I’m having a lot more fun and making discernible progress! My new coach, Armin, is a really good fit for me, both in character and work style, which makes an enormous difference. And as a team we have upgraded our training regimen from a quotidian slog in Lake Placid to two weeks of intensive camp followed by two weeks of independent training. In this rhythm we balance periods of focussed learning with time to process, practice, and recover. Even with the built-in recovery block, I’ve had some mental and physical breakdowns because I’m training harder during the camp weeks than I ever did previously. But Armin is receptive to my feedback so we are working out the kinks of the physical training plan. Meanwhile my shooting is definitely improving! I’m also growing into my new role as the Chair of the IBU Athletes’ Committee. I want to do the job well so I find myself devoting hours each week to it. I’ve enjoyed getting to know my colleagues, Martin Fourcade (France), Erik Lesser (Germany), and Aita Gasparin (Switzerland). In September the IBU will convene its biennial Congress, at which delegates from the national federations will vote on a motion put forth by our Committee to create a seat on the Executive Board for the Athletes’ Committee Chair. If it passes, athletes will secure a long-overdue voice within the IBU leadership, and I will have significantly more responsibility– but I am up to the challenge! To summarize, I’m just as physically empty as I’ve been in past summers, but more emotionally fulfilled. Here’s a photo recap of this busy spring and summer so far. First time on a red carpet: Team USA Awards night in Washington D.C. in April. My German colleague Erik Lesser and me at our first Athletes’ Committee meeting in Austria in May. Starting from scratch with a new stock. Upgrade from wood to carbon fiber by Bachmann Biathlon. Not target practice. If I can shoot a standing group smaller than the target when aiming at literally nothing, how do I ever miss, you might wonder? I thought I was done with roller-skis, but alas here I am, rolling into the new season. First camp of the year in June! Snack time on the way to training with Susan, #Tired. Our first women’s camp, organized by Susan to bring together national team women and other top women who share the same goals. New Sponsor #MALOJA! We LOVE it! Smiles and heat exhaustion at the 2018 Beach to Beacon 10k in Cape Elizabeth, Maine. Photo by Chris Conti, http://www.spectaclehill.com. Roller-ski racing in Jericho, VT in August. My body was tired and not performing at high capacity so I focussed on good shooting and came through with a podium finish in the mass start. Training Camp in Craftsbury, VT, featuring a highlight trip to the Barton County Fair demo-derby. After a year of uncertainty and six weeks of stressful internal debate, I finally made a decision about my athletic future. Here’s a look at the somewhat convoluted thought process that led to my decision. Biathlon is really hard work. And over the past two years, I haven’t felt like my hard work paid off. That may come as a surprise to those of you who are thinking, “You made the Olympic team!” But zoom in and you’ll see that my results have plateaued and my shooting accuracy has trended downward since 2016. The macro-level success of qualifying for the Olympics was couched in a bed of micro-level failures that have predominantly shaped my day-to-day attitude and emotions. 2018 Olympics Sprint: I finished 61st, failing to qualify for the Pursuit by 1 place and less than 2 seconds. Qualifying for the team is but a brief moment in the timeline of the Olympic experience. The true goal of every self-respecting athlete is not just to qualify but to perform well once you are there. My one perfect, glorious performance in the women’s relay was not enough to outshine my mediocre individual results. The Olympics were arguably US Biathlon’s worst showing at any international event in the last four years. To say morale was low would be an understatement. This agony of defeat is real. The thrill of victory: In my first race after the Olympics I set a personal-best of 13th at World Cup 7 in Finland. Never gets old: I love racing in front of huge crowds of screaming fans. There are also a number of major changes on my team that make me feel optimistic about the future. First of all, I will have a new coach, Armin Auchentaller. I know it’s the right time for this change and I think he’s the right person for the job. Second, our team is shifting away from a full-time, Lake Placid-based training model to a camp system: two weeks of focussed and supervised training camp, then two weeks of self-directed training at home. With one week of solo training under my belt, I can report that I never realized how oppressed I was under the old system until now. It’s a challenge to train alone, but on the other hand I have freedom, space to learn, and flexibility for (some semblance of) a personal life. Third, we have an opportunity to create a new team dynamic that is more inclusive, positive and supportive. The retirement of two World Championship medalists certainly leaves a hole in our team’s depth chart, but that hole is also a space for new leaders. An omen for next winter? Susan finished on the podium in the final race of the 2018 season. One deciding factor unrelated to team structure or my internal psyche is that I simply don’t have anything else lined up. Most people can probably relate to not wanting to quit one job until they find the next one. I am giving myself one more year to figure out what’s next, and to plan a great retirement party! I am also giving myself one more year to really solidify the tradition we debuted this year in Pyeongchang of a Biathlon World Cup Valentine’s Day card exchange. And one more year of European hotel saunas; one more year of massage; one more year of ski-testing (or is it just socializing?) with my personal wax tech; one more year of being a fine-tuned athletic machine; one more year of racing for Team USA; one more year of agony; one more year of thrill; one more year because my brother says, “real life is the pits– you gotta keep the dream alive!”; one more year because I still have something to give; one more year because it’s fun and it’s cool and once it’s over there’s no going back. My trip to the Olympics began in quarantine due to illness! Not the best physical or mental preparation. “Team Processing,” where I first got to try out my new Olympics gear! I dove right into the cultural activities. This is me wearing traditional Hanbok clothing. Inside the Olympic Village: welcoming ceremonies in the Village Square. Inside the Olympic Rings… who would have thought!? Marching in the Opening Ceremonies… a dream come true. Opening Ceremonies at the Olympic Stadium. My bedroom for almost 3 weeks in Pyeongchang, complete with an Olympics quilt. Out on course for my first Olympic race! It was very disappointing as I crashed an also missed 3 on the range, finishing 61st, just 1 spot out of qualification for the Pursuit race. I got to use my Korean skills with Mr. Ban-Ki Moon, the former Secretary General of the United Nations. Here I am in the Village Square in the Olympic Village. Waving to the crowd after my 15k Individual race. I skied slowly and had okay shooting– three good stages and one bad, 0301– good enough for 62nd. Five other women from the Craftsbury Green Racing Project (four shown here), plus coach Pepa, joined me at the 2018 Games! I did an interview with NBC… what an experience! Following my lackluster 7.5k sprint and 15k Individual performances, I was not selected to compete in our team’s mixed relay. This was the low point of my Olympic experience. Behind the scenes: US Biathlon changing cabin. The woodwork and paint was extraordinarily ornate. All the traditional buildings I saw shared a similar style and color scheme. My brothers Guy (left) and Graham (right) with me in Hanbok! 10-for-10 shooting in the women’s relay!!! Finally an Olympic race I am really proud of. Our team was in medal contention through 3/4 of the race. Celebrating in the stands with my family! What a joyful moment! After my races were over I visited Seoul for a day. This is the view from the big mountain/park in the city center. Ancient meets modern in Seoul. The beautiful Korean coast on the East Sea in the town of Gangneug. Closing Ceremonies. The Olympics were not all smiles but the smiles I did have were really big. The three weeks I spent in Korea were like a microcosm of my whole biathlon career: exhausting both physically and psychologically, with emotions alternating between extreme disappointment and overwhelming reward. After a disappointing start to my second trimester of World Cup racing (there are few biathlon scenarios more painful than shooting 0,4), it was time once again, for me to do the ol’ biathlon rebound! You would think this would get easier, but so far in my experience it does not. I think nowadays it takes more to knock me down, but once I’m down, it’s still just as hard to get back up. In these moments, I usually reach out to my shooting coaches for a suggestion of something to actively work on. Having an explicit mission on the range helps me focus on the shooting process rather than the outcome. It’s the difference between “follow through on the trigger squeeze” and “really try to hit.” The former is much more effective in producing good shots, but the latter is as pervasive as it is illusive! Meet Sepp, a self-declared “Bavarian Cowboy” who is our team driver every year at the World Cup in Ruhpolding, Germany. Behind the scenes in Ruhpolding: each World Cup venue provides cabins like these for teams to store equipment, prepare skis, etc. We usually rent two of these shipping-container-cabins. With renewed confidence in my race plan I set out on the women’s 15k Individual at World Cup 5 in Ruhpolding. In this race format, athletes shoot four times (prone, standing, prone, standing) and each miss results in a 1-minute time penalty. I shot 0,1,0,2 and was very happy with my performance. The result– 57th place– is definitely not what I’m looking for but I had zero complaints about putting together my best shooting and skiing of the season. A few days later in my team’s first women’s relay of the year, I cleaned standing! It was my first time so far this year, and coming on the heels of my 4-miss blunder in Oberhof, I was pretty happy with this edition of the biathlon rebound! Post-race in Ruhpolding! Finally a “normal” race in the 15k Individual with decent shooting and skiing! Finally we had four women on the World Cup and were able to participate in the 4x6k women’s relay! A good day for our team. 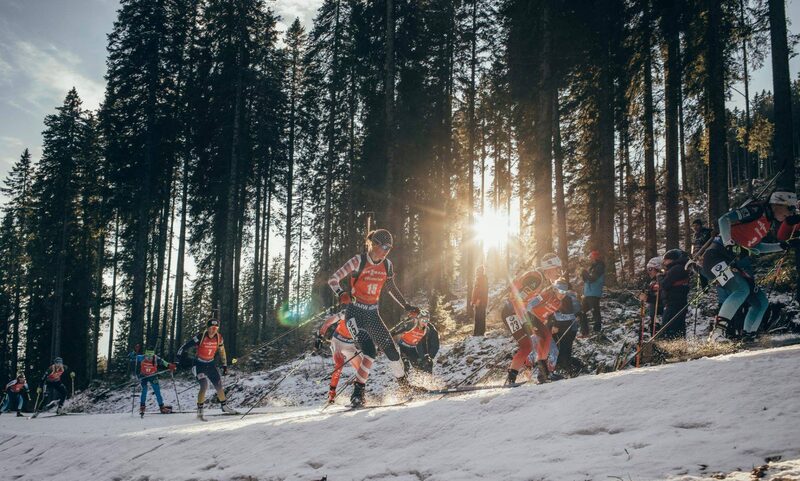 Next up we headed to World Cup 6 in Antholz, my favorite stop on the tour. And this time we arrived on scene with our newly-named 2018 Olympic Team. Susan and I were joined by Joanne Reid, Emily Dreissigacker, and Maddie Phaneuf. A precocious junior athlete, Chloe Levins, just missed this year’s Olympic team but I have no doubt you’ll see her in future editions, should she choose to continue on her star-studded path! New record for number of women in a World Cup wax cabin! L-R: Clare, Emily, Chloe, Maddie, Susan, Joanne. Sunny Antholz, with the TV camera filming from the top of the crane! Trailside sign with my favorite slogan from my favorite fan club! In the sprint race in Antholz, I got kind of foiled by the wind (or maybe just shot badly?) in prone and missed 2. That’s a rough start in the sprint– a race format in which I know I can only afford a couple of misses if I want to finish in the top 60 and qualify for the pursuit. In standing, everything went great until I missed my last shot. With three misses, I wasn’t sure I had a chance but I really pushed on the last lap, and when all was said and done I was in 56th. I would live another day! My pursuit race started off great– I shot clean in prone (0,0) and moved into the top 40, then missed only 1 (my last shot again!!!) in the first standing stage, and then in the final stage, something crazy happened! My legs started shaking like I was standing on some kind of vibrating platform. I took forever and really fought for my shots but still ended up missing 2. I left the range behind a young French athlete, Justine Braisaz, who is one of the fastest skiers on the biathlon World Cup. I have never been able to stay with her before, but on that day, I could and I did, all the way to the finish! My friends Maura and Kenny flew all the way from the US to watch the races in Antholz, which was AWESOME!!! My boyfriend was also in town, coaching our IBU Cup team, so the four of us were able to spend some time together. Behind the scenes Antholz: Who wore it best? My teammate Sean Doherty and I are really twinning this year, especially with our matching haircuts. After the races in Antholz, I took the train to the Italian city of Trento where I spent a few days off touring the city by myself. I really needed the break after three straight weeks of on time. I headed back to the mountains on Wednesday to meet up with our IBU Cup team for European Championships. Since my season hasn’t been going that well and I haven’t qualified for many races, I decided I wanted to get a few more competitions in before the Olympics. Ridnaun is really beautiful, and the site of my first clean biathlon race back in 2015. I was really looking forward to another opportunity for a good race! But that all went down the drain when I came into shoot prone and the buckle on my sling broke! The sling (pictured below) is a vital piece of equipment for prone shooting. Biathletes wear a cuff around their upper arm, to which this sling hooks, in order to stabilize the rifle. It’s so taught that it effectively eliminates the need for you to use your bicep to hold up the rifle. So without the sling, it is extremely wobbly. When my sling fell apart, I didn’t think I had any chance to hit any of the targets but I actually hit 2! With 3 penalty loops right away in prone I wasn’t sure if I would make the pursuit but I just tried to have a good time and I even waved to my boyfriend from the penalty loop! I missed 1 more in standing and finished in the 70’s so not my best shooting or skiing either. One really fun part of the weekend was reconnecting with my friend Joris. He used to be responsible for all the biathlon Eurovision broadcasts so I would see him weekly all winter long, but since he got a promotion he now manages other sports as well and I hadn’t bumped into him at all this season. It was a pleasant surprise to see a familiar face on the trail! He showed me around the Eurovision broadcasting station live on-scene in Ridnaun! Joris at the helm of the Eurovision studio on site at European Championships in Ridnaun, Italy. Eurovan front seat selfie! Don’t worry I put it in park before snapping. L-R: Jean, Erik, Clare, Chloe. My idea for an A Capella group for Olympians. Graphic design by Hannah Dreissigacker. I am in Korea now, still quarantined in a different hotel from my team. It’s been 10 days. I am feeling totally fine now, only in my voice you can hear some residual congestion. Tomorrow I have permission to finally rejoin my team and start training again. My first race is in 5 days. My next blogpost will include pictures from the Olympics! In the meantime, stay informed about what’s going on the anti-doping world. it’s been a tragic week for clean sport. This article sums up how I feel. I spent two weeks in the US over Christmas. After spending seven of the previous eight weeks on the road, I was so happy to be back in my own apartment and my own bed. Believe it or not, our pre-Christmas travel is just the beginning. I flew back to Europe on New Year’s Eve and I will return to Lake Placid the first week of April. Back in my own bed!!! Our little apartment with Hilda (pig on table), our “Christmas Tree” (left) and our view of Mirror Lake. First thing’s first: baking delicious, buttery scones. When I first got home, I had a few days off to recover from a cold, get on the right time zone, and do a lot of phone interviews about the Olympics! Talking with people who are really excited for me helped me feel more excited too. I am still disappointed with how my season is going relative to previous years, but I am so happy and relieved that I met my goal of qualifying for the Olympics before Christmas. Once I felt healthy enough to venture outside, I was back at the shooting range! Soon after I arrived in Lake Placid we got a blizzard, and then the sun came out and the temperatures dropped, and dropped… and dropped. On the coldest day the high was -7 degrees Fahrenheit. It made it really difficult to train! I had to work out indoors on the roller-ski treadmill because I didn’t want to hurt my lungs. When I did brave the outdoors, I had to wear so many layers that shooting was a challenge. Sunrise on the winter solstice, one of my favorite holidays! Fresh tracks at the biathlon range in Lake Placid. Representing UNH Skiing in the gym! Erik and I went to his parents’ house in Rochester, NY, again this year for a couple of days at Christmas. It was really nice to be in a very Christmasy home with the whole Lewish family. My parents live in Florida during the winter, which is not a great place to train for skiing! So I’m lucky Erik’s family is relatively close by. I struck Nordic gold when I found Audrey Mangan for a 3-hour ski on Christmas Eve in Rochester, NY at Mendon Ponds Park. It is wonderful to go home for Christmas, but now that I’ve flown back to Europe and slogged through my first race, I remember why many American winter-sport athletes make the difficult decision to commit to five full months of hotel life: it is nearly impossible to perform well after travel! On top of the major germ exposure, sleep deprivation, substandard nutrition, and long hours crammed into a seat, anyone who has flown across timezones knows how out-of-it you feel for a few days. The common saying is that the adjustment takes one day per hour of time change. I don’t think I am truly back to my optimal physical and mental capacity for at least that long. Consequently, our first races of the season in November and again after Christmas in January are somewhat sacrificial. And when they don’t go well, the confidence blow can be hard to overcome. After working so hard all summer, it’s extremely frustrating to thwart your own chances for success. But that’s my choice: five months of hotels, or a Christmas at home that all but guarantees dismal performance come January. I went home and saw my boyfriend and ate scones and slept in my bed. And that’s that. Back in Oberhof, Germany where the annual Biathlon World Cup week means 7 days of fan parties. Oberhof behind-the-scenes parking lot full of team wax trucks. Our team van. Only the essentials, right Susan? I am now in Ruhpolding, Germany getting ready for World Cup 5, which kicks off on Wednesday, January 10th with the men’s 20k Individual. My next race is the women’s 15k Individual on Thursday the 11th. Then on Saturday, Susan and I will finally be joined by two more American women so we can compete in our first 4x6k women’s relay! We had to sit out the first two relays of the season while other American athletes progressed through various stages of team qualification. There are now just four women competing for the remaining three Olympic Team spots– 2 plus 1 alternate. We will know on Thursday who our relay and Olympic teammates will be. Four years ago, I set my mind to doing everything in my power to avoid competing in these last-minute, high-pressure, high-stakes races at which beating your own teammates inevitably becomes your primary objective. Not everything has gone my way this season but pre-qualifying for the Olympic Team in December definitely did!!! We love our new promotional video and I think you will too! Our journey from Austria to France for World Cup 3 was a day that will live in US Biathlon infamy. Thanks to a blizzard, our 8.5-hour drive turned into almost 16 hours and concluded with the whole team pushing the van up the driveway to our rental house at midnight. Worst of all, we were under a time constraint to get to the Mont Blanc tunnel before a scheduled closure, so we only stopped twice the whole day for quick snacks and a bathroom break. Getting enough food is one of my biggest challenges so this was a major setback. I started coming down with a cold the next evening. Two days later, fighting the cold, I slogged through the sprint, missing 3 targets and placing 81st. It was my worst result in a few years. My teammate Susan, on the other hand, who had struggled mightily on the shooting range at World Cups 1 and 2, accomplished a heroic biathlon turnaround by shooting clean to place 10th. We were all ecstatic for her. Susan moved from 10th to 6th in the pursuit– back in the flower ceremony where she belongs! Joining me in the disappointing-race club was my other teammate Emily, who also missed 3 and finished in the 80’s. Neither of us would be moving on to the pursuit race. Time to pack our bags and head home for Christmas. It was in this moment that I technically clinched my Olympic Team spot. My 35th place from the sprint in Hochfilzen at World Cup 2 stood as the top result between Emily and me. Susan is pre-qualified for the Olympics. Emily would have to return to the 2nd-tier IBU Cup after Christmas to battle it out with other top women for the remaining three spots. I felt anything but triumphant. I had just finished my worst race in years, I was leaving the first trimester of racing with fewer World Cup points than I’ve had in any other year, and I took zero pleasure in Emily’s bad race. I was sick and tired. I had some special people watching on course that day: my parents and my unofficial host family from my semester abroad in Switzerland. I wish they all could have a seen a more beautiful race but I was glad to have them there nonetheless. After the race we all drank hot chocolate and spoke Frenglish together. My parents came all the way to France only to watch me do one bad race. But their attendance soon served a greater purpose when they put me up in their hotel so I wouldn’t give my cold to my teammates. We watched the pursuit races together from the stands. It was an unfamiliar vantage point for me and a reminder that, in spite of all the frustration, I still prefer to be on the athlete’s side of the fence. Then we drove down to Geneva for the night, where my parents treated me to steak tartar, Glühwein, and a choir concert. It felt good to escape from the biathlon circus and plant my feet firmly in the real world. The next morning, I woke up to messages and emails congratulating me on making the team. I read my name in the press release: “Clare Egan achieves Olympic Dream.” I still felt like I was in a biathlon nightmare. I knocked on my parents’ hotel room door and told them the news. Then I got on a plane and flew back to the U.S. early, a day before them. There was no crossing the finish line in a blaze of glory, fists in the air, running into my coach’s arms, reaching to hug my mom in the stands. I think in a way I’m mourning the loss of that moment. I am trying to let go of the romantic vision I had about how anything pertaining to the Olympics is supposed to go or feel. Three days, four phone interviews, and hundreds of congratulatory messages later, I am still struggling to reconcile acute near-term disappointment with totally overwhelming long-term achievement. It’s the thrill of victory and the agony of defeat all at once. I finally let Susan congratulate me today. This will be her second Olympics; she narrowly missed making the team in 2010 and then pre-qualified in 2014 as the top American woman biathlete in history. “It’s a big emotional load, no matter how it falls,” she said. In 2014, when I asked Susan how she felt about qualifying for her first Olympics, she said “ready.” My emotions may be all over the place, but I can say with complete certainty that I am ready, too.